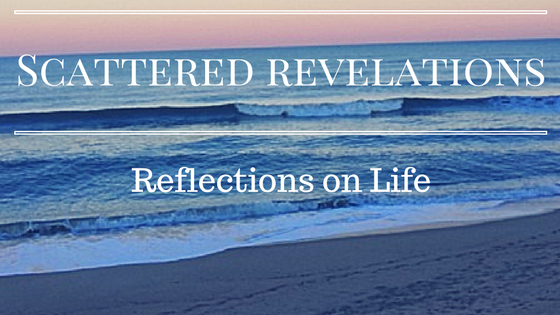 I preached this sermon on Sunday January 11, 2015 at the Unitarian Universalist Congregation of the Outer Banks. After three days of fasting, I had forgotten gain and success. "Everything in the Universe has a nature, which means limits as well as potentials, a truth well known by people who work daily with the things of the world. Making pottery, for example, involves more than telling the clay what to become. The clay presses back on the potter’s hands, telling her what it can and cannot do – and if she fails to listen, the outcome will be both frail and ungainly. Engineering involves more than telling materials what they must do. If the engineer does not honor the nature of the steel or the wood or the stone, his failure will go well beyond aesthetics: the bridge or the building will collapse and put human life in peril. The human self also has a nature, limits as well as potentials. If you seek vocation without understanding the material you are working with, what you build with your life will be ungainly and may well put lives in peril, your own and some of those around you. “Faking it” in the service of high values is not virtue and has nothing to do with vocation. It is an ignorant, sometimes arrogant, attempt to overrides one’s nature, and it will always fail. As I was beginning to work on this sermon, I did something I often do, which is post on Facebook people’s ideas for Humanist Spiritual Practices. One of the best responses I received came in the form of questions. The first question I got was what is humanism. I realized that we often talk about humanism but we don’t often define it. So what exactly do we mean by humanism. Humanism emerged in the early twentieth century. The intention was to reformulate religion. In the first Humanist Manifesto published in 1933, they write “The time has come for widespread recognition of the radical changes in religious beliefs throughout the modern world. The time is past for mere revision of traditional attitudes. Science and economic change have disrupted the old beliefs. Religions the world over are under the necessity of coming to terms with new conditions created by a vastly increased knowledge and experience. In every field of human activity, the vital movement is now in the direction of a candid and explicit humanism. In order that religious humanism may be better understood we, the undersigned, desire to make certain affirmations which we believe the facts of our contemporary life demonstrate.” They will go on to list fifteen affirmations about the nature of religious humanism and the value for human life. While they leave open the possibility of future discovery of the supernatural, they affirm trust in science and reason as the foundation of human flourishing. At its heart humanism affirms the goodness of humanity and the goodness of life. Here is the final affirmation: We assert that humanism will: (a) affirm life rather than deny it; (b) seek to elicit the possibilities of life, not flee from them; and (c) endeavor to establish the conditions of a satisfactory life for all, not merely for the few. By this positive morale and intention humanism will be guided, and from this perspective and alignment the techniques and efforts of humanism will flow. So when we talk about spiritual practices for humanists, it would be those practices that affirm the goodness of human life; that connect a person with their authentic self – the self that longs to be the best human possible. When we talk about a spiritual practice, we are talking about an activity – a practice that one engages in on a regular basis for the purpose of recognizing that we are not just ourselves, to explore beyond the realm of ego to connect with deepest held values, beauty, truth, connection with others and the earth. It must be done regularly as just like exercise for the body and books for the brain, nurturing the spirit requires regular and sustained attention. In our story this morning, the woodcarver engages in practices that allow him to set aside all ego and all concern or anticipation of success or failure. It is only then that his art can emerge from the deepest place within himself. It was that deepest part of himself connecting with the beauty of the wood that created the bell stand. It was only by letting go of ego, that the wood carver could create the beautiful bell stand that others saw as so beautiful it must have been created by spirits. The story demonstrates that when an artist connects with their deepest self, beauty can emerge but first the artist had to connect with that deepest truest sense of self. As human beings we often spend much of our lives not being ourselves, we search long and hard to discover who we truly are and meant to be. In the words of May Sarton “Now I become myself, It’s taken time, many years and places, I have been dissolved and shaken, worn other people’s faces…” So those practices that connect us with our own nature, with our gifts and limitations, are the spiritual practices that will connect with us our deepest selves. Parker Palmer focuses much of his writing on becoming one’s authentic self. In this particular book, Parker shows that it is through discovering one’s true nature that one discovers their work in the world. Parker in fact argues that not doing the work to discover one’s true self can do great damage to oneself and to others. We serve both ourselves and others best when we do so from a grounded knowledge of ourselves and our true nature. Then we can serve our highest values and meet the world’s great needs. So what practices might best support this quest to become one’s authentic self? For some that might be walking on the beach and connecting with the beauty of nature, quieting the mind and allowing ourselves to connect in the moment. For some it might be sitting in silence, quieting the incessant to do lists, self-criticism and the other noise in our minds. In getting quiet we can go deep within, listening for that inner voice, that authentic voice. Most spiritual practices can be done with an intention that does not include belief in God. So Yoga, meditation, reading and journaling are all practices that can connect an individual with the deepest parts of themselves as well as engagement with the world. One of the affirmations of the manifesto is the flourishing of all of human life. Humanism is not just concerned with the betterment of the individual but the betterment of all of humanity. This concern is not driven by guilt or fear of punishment but rather a concern for humanity as a whole. Humanism affirms cooperative effort for the betterment of all humanity. So spiritual practice can include working for social justice causes; such as volunteering in the community, voter education, marches, participating in advocating for a better society. 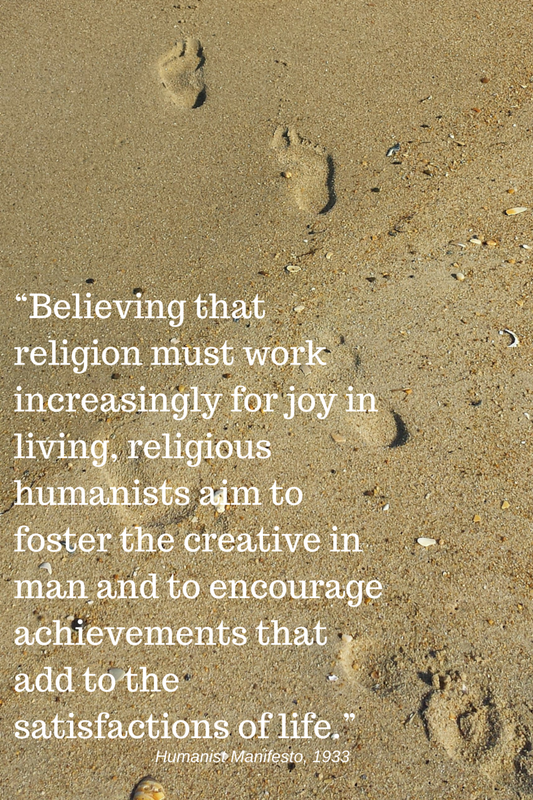 Humanism affirms joy in human life, in the here and now. Its focus is on the best of what life has to offer now – not waiting for an uncertain and unknowable after life. It also does not limit that joy to a selfish quest for self-fulfillment but rather a better world for everyone. The original manifesto affirmed that all institutions were to support human life. So what is it that connects you with your deepest self? Where do you find the places that allow you to get quiet and hear your own deepest self? How do you bring your own authentic self to serving the world; to the flourishing of all of humanity? Is participation in this community of UUCOB one of your spiritual practices? Does it foster a connection with your deepest self as well as giving you ways to serve others? At its best this community fosters connections between people but also within ourselves. In coming together with others to listen and to sing, to hear a message, our minds and hearts are stretched. Both Palmer and the Woodcarver story remind us that we must let go of our ego, let go of that false self in order to live authentically and with integrity. Faith communities at our best help us to let go of ego. Faith communities also give us opportunities to serve others, to use our gifts in the service of others. They also give us opportunities to stretch and learn new skills. Humanism was not a rejection of religion but rather a reimagining of religion as an institution that cultivates human flourishing. Spiritual practices for humanists are those practices, those disciplines that connect individuals with their deepest selves, with their true nature. They also connect us to how our true selves, our true natures can serve the world. It is in becoming our truest selves that we also connect with our deepest spiritual selves in whatever ways we understand the spiritual and spirituality. So regardless of our beliefs, humanism teaches all of us that our best spiritual selves are also our best human selves. Our early Unitarian ancestors, like William Ellery Channing and Theodore Parker affirmed that humanity is made in the image and likeness of God so in becoming our best selves we become the embodiment of our highest beliefs about the holy. Humanism reminds all of us that it is only through our own experience, limited as it may be, to experience life and the fullness of it. Humanism reminds us that the only life we can truly know is the one we have right here and now.